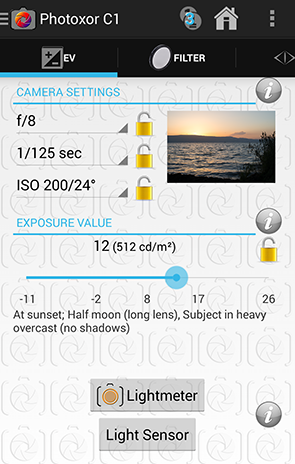 The Android application Photoxor C1 provides a rich photography toolset for photographers at all levels. 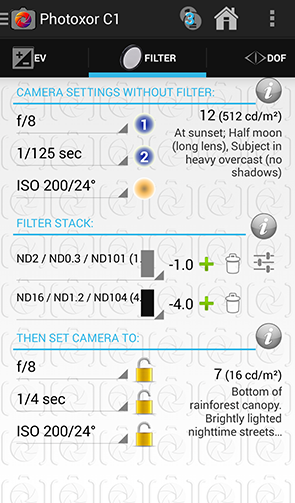 Beginners may use this tool to better understand how exposure, aperture, exposure time and film sensitivity (ISO) depend on each other. The advanced photographer may calculate camera settings for "black glass" filters, plan a photoshoot considering Blue Hour, sun and moon directions. Which Photoxor C1 functions did you explore so far? With this article let's walk through 10 typical use scenarios. Prepare you camera settings for a particular lighting scenario. Using the EV slider browse through the lighting scenarios and find the closest match. Aperture, exposure time and film sensitivity (ISO) are calculated and set to represent the correct exposure. Press the lock symbol close to the EV slider; this will 'lock' the value to the chosen setting. In our scenario shown here you might want to use a smaller aperture (say f/16) to extend your depth of field for a landscape photograph. Select f/16 and close the aperture lock. Now the aperture value is fixed. Only two parameters are left to change: ISO and exposure time. When you change one of them, the other value changes to retain correct exposure. Please try out this screen yourself and see how it best fits your workflow. The application provides two ways measuring the illumination. One is based on the device camera, the other on the light sensor. They are only enabled if your device has a built-in camera / sensor. The camera based lightmeter function uses the device camera to take a picture and then calculates an indicative EV. Again, try it out and see how well it works on your device. The light sensor based lightmeter function brings up a dialog window and shows the currently measured illuminance in lux together with the corresponding EV. Once the EV is measured, adjust aperture, exposure time and film sensitivity (ISO) as described above. You just determined camera settings for the lighting scenario. How do we adjust settings for a stack of neutral density filters attached to the lens? What stack of filters do I need to achieve long exposure time? Go to the Filter screen. The top section shows the camera settings as entered on the Exposure screen. Now add one or more filters (note: multiple filters require the Filter Pro add-on). In 'Settings' you are able to define your own filters. Below you'll see the adjusted camera settings. Again, use the locks to fix one of the settings, and 'play' with the others. For a detailed step-by-step guide have also a look at this blog post. The mysterious "Depth of Field", key to a sharp image and beautiful blurry backgrounds. What's the correct camera setting, and what lens (i.e. focal length) do I need? This screen guides you towards the answer. Sharp / unsharp is not really a hard boundary. The 'sharpness' is represented through the Circle of Confusion (CoC). Larger CoC values indicate less sharpness. Have a look at the graph to see how the CoC changes with distance. The distance range where the CoC (yellow line) is below the black dashed line (the reference CoC) is considered sharp. There is also a red line ... representing accumulated CoC and diffraction. How do we get this reference CoC to define a useful boundary? 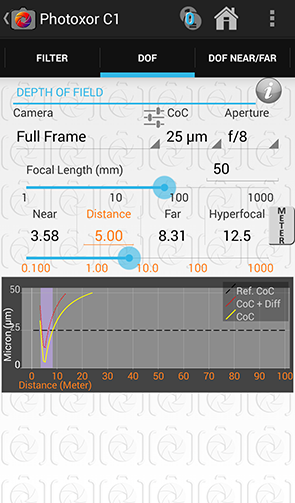 Photoxor C1 automatically calculates a CoC value based on your camera details. This is a good value in many cases. To calculated your own scenario, just continue reading the next point. What level of sharpness do I need for a large print? What is the required print resolution? First define the characteristics of your intended print. 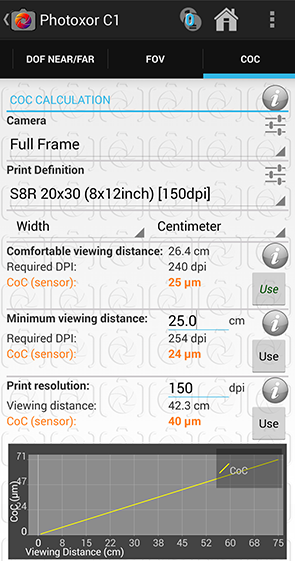 Now select camera and print definition. based on the print resolution (dpi) offered by the printing device; what's the matching CoC value for a given dpi value. Once you determined the CoC for your scenario, just press the Use button and apply to the DoF screens. Most professional cameras don't provide a built-in GPS. Not a problem. Go to the Tracking screen and switch on 'Logging'. 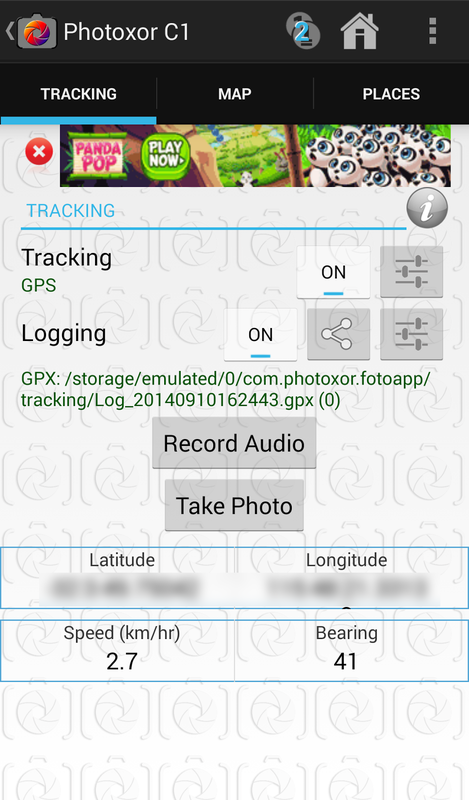 This will record your location and movement. Have a look at the tracking / logging related settings to configure how often you want to record, what data format to use. Also make sure that your device clock is in sync with your camera clock. When back home import your images and logging file into a tool such as Adobe Lightroom and perform geotagging based on the timestamps. Tip: For Adobe Lightroom best use the GPX recording format. Do a trial run and see how it works for you. Tip: While inside a building with limited GPS reception you might want to switch off 'Tracking' to conserve battery power, but don't forget to switch back on. Recording continues to the same logging file. Planning for travel? Or just for a daytrip? How to remember all the places you intend to visit and where the best shooting locations are? At home use a tool such as Google Earth to locate and mark the places of interest. Export as KML file and transfer to your device and store in the com.photoxor.fotoapp/places data folder. When you are out in the field, even without Internet connection, you are able to load your places KML file using the Places screen. The application even shows you how close (or far away) you are, and what's closest to you. You are able to put places onto the map. If the particular map region is cached on your device you might be able to view even without Internet connection (try to cache map regions in Google Map while connected). What's the direction of sun and moon? Do we have full moon today? Actually you get quite a bit more information; just have a look at the Ephemeris page. Search for a location or just use your current location, enter date / time and rise, transit and set times and directions are calculated. Sun and moon movements throughout a day are visualised in a graph. 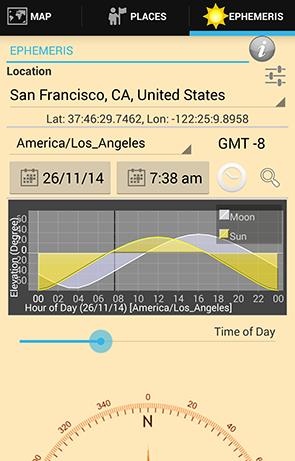 And it works together with the Map screen to display sun and moon directions. Tip: Always check what timezone is used. Usually the local timezone of the selected location is used for time. This feature is quite powerful and also provides location search capabilities. For a detailed guide on sun and moon calculations please also see this blog post. What is the best time to photograph when you visit a place? When is the Golden Hour? When is the Blue Hour? 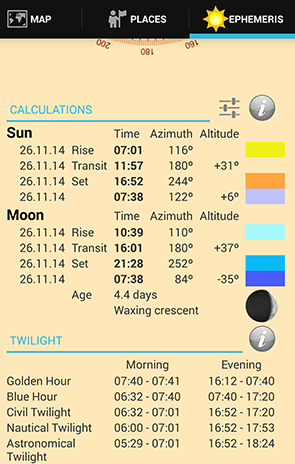 Our Ephemeris screen shows you all of the usual twilight situations for morning and evening. When you prepare for your photoshoot select or search for the location, enter the date, and you immediately know Golden and Blue Hours. Hopefully the weather plays its part, too. Photoxor C1 now provides a built-in compass*! Try it out and see how good it works on your device. 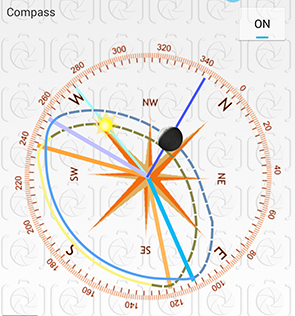 Go outside, hold your device flat and see how the compass adjusts direction. Set for your current location and current date/time, and the sun and moon directions should point you directly to the celestial objects! No Internet connection is required for the compass function. Please be aware that in particular withing buildings it might get quite inaccurate due to electric and magnetic influences. * The compass function works only on devices with a built-in magnetic sensor. The accuracy may vary; in particular ensure that there are no magnetic or electric influences close-by, and hold your device horizontal for best results. What is your preferred usage of Photoxor C1 and how do you incorporate in your workflow? In case you haven't installed the application, just go to Google Play and download for free now. This application is quite nice. If there is to be any improvements in it I would like to be able to delete items, i.e., lens, cameras, or flash equipment from each list without having to type over an item that I don't have anymore in my inventory. Other than this this tool is great. All of the Photoxor lists allow to delete items by swiping the item (within the list) either to the right or left. It is then removed from the list and placed in a temporary archive, just in case you want to recover a deleted item. To add a new item press the round + button, which brings up a blank new entry. Hopefully this works for you. Please let us know if you need any further information.